Try as they might, chemical engineers just can not recreate the natural beauty that mother nature has in Western Red Cedar. In the end, synthetic or plastic sidings just can't match the warm and rich appearance, so they end up looking "cheap"...even though they aren't. Synthetic sidings advertise minimal maintenance, but maintenance is still required. Mold & fungus grow on plastic or cement sidings, yet real Western Red Cedar has natural tannins that help prevent rotting and mildew. Composite or cement sidings require a primer and paint to "color" the siding, where natural Cedar can be left...natural. Cedar can be painted or stained, but it is not required. Even yearly maintenance, although it will help keep the rich, warm color you start with is still not required. Cedar weathers naturally and will gray, but a simple pressure wash will bring color back out and a pressure wash is much friendlier on the environment than stripping paint off of composite siding. 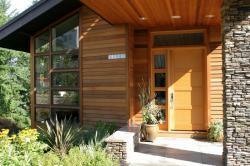 Real Western Red Cedar is one of the most environmentally friendly sustainable building materials available. It produces the least greenhouse gas, air pollution, water pollution and solid waste. 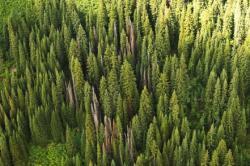 Sustainable growing means our Cedar forests are growing healthier than ever before so you can feel good about your choice in wood. 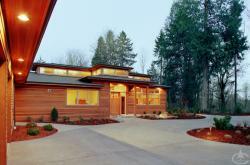 The light-weight and air-filled cell structure of Western Red Cedar Siding means more resistance to thermal transfer. That means money savings for you as it requires less insulation to achieve the same R-Value, and less heating/cooling costs. The interior temperature stays more steady and requires less utility costs to maintain. Savings in your pocket, every year, forever.